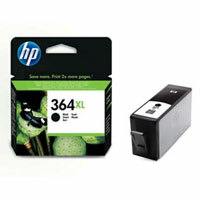 Čierne atramentové kazety HP 364XL. Hardvérová kompatibilita s HP Deskjet 3070A e-All-in-One, Deskjet 3520 e-All-in-One, Deskjet 3522 e-All-in-One, Deskjet 3524 e-All-in-One, Officejet 4620 e-All-in-One, Officejet 4622 e-All-in-One, Photosmart, Photosmart 5510 e-All-in-One, Photosmart 5514 e-All-in-One, Photosmart 5515 e-All-in-One, Photosmart 5520 e-All-in-One, Photosmart 5524 e-All-in-One, Photosmart 6510 e-All-in-One, Photosmart 6520 e-All-in-One, Photosmart 7510 e-All-in-One, Photosmart 7520 e-All-in-One, Photosmart B010a CN255B, Photosmart B109, Photosmart B109a, Photosmart B109d, Photosmart B109f, Photosmart B109n, Photosmart B110, Photosmart B110a, Photosmart B110c, Photosmart B110d, Photosmart B110e, Photosmart B209, Photosmart B209a, Photosmart B209c, Photosmart C309, Photosmart C309a, Photosmart C309g, Photosmart C309h, Photosmart C310A, Photosmart C410b, Photosmart C5300, Photosmart C5320, Photosmart C5324, Photosmart C5370, Photosmart C5373, Photosmart C5380, Photosmart C5383, Photosmart C5388, Photosmart C5390, Photosmart C5393, Photosmart C6324, Photosmart C6350, Photosmart C6380, Photosmart C6383, Photosmart D5400, Photosmart D5460, Photosmart D5463, Photosmart D5468, Photosmart D7560, Photosmart eStation (C510a), Photosmart plus, Photosmart plus B209, Photosmart Plus B210a, Photosmart Plus B210c, Photosmart Premium, Photosmart Premium (CQ521B), Photosmart Premium Fax, Photosmart Pro B8550, Photosmart Wireless CN245B. Výdatnosť strán (čiernobiela) 550 strán*.